Lies and misconceptions about Matera: a quick survival guide. Tourism business in Matera is relatively young, and there’s still a lot to do to improve it. As soon as they set foot in the city, visitors could easily end in classic tourist traps set for them. Welcoming, for instance, is mainly managed by private tour operators. Keep that in mind when you will be immediately approached by promoters or while following street signs. Even info points and kiosks, in fact, are managed by agencies and tour operators. This wouldn’t be a problem if everything would happen in complete transparency. Which is not, not always. “The services must be provided with the principle of maximum impartiality, without favoring in any way particular business establishments, categories or subjects and without asking any compensation to the users for the information and the services provided”. 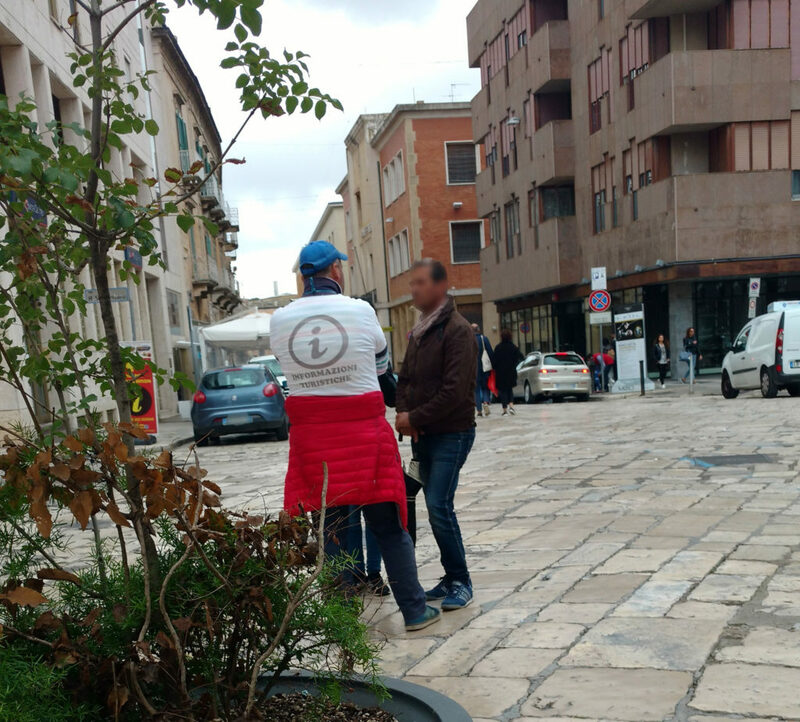 As a general rule, don’t trust anyone claiming to be a public employ (with even a fake badge) nor whoever offers guided tours organized by the local or regional governments (Comune di Matera – Regione Basilicata). Such things simply don’t exist! The only true representatives of the local government that you’ll find on the streets are members (in uniform) of local police. You can trust them to ask for simple directions or to report weird or illegal behaviors. Also, the only APT (the public agency for the promotion of the territory) office in town is on via De Viti De Marco. Not exactly in a visible spot and not even used to welcome tourists. Anyway, APT can’t and won’t provide guided tours of the city directly. As the private info points, they could just provide the regional registry of the local authorized tour guides. So if someone claims to be the APT or some kind of public office and try to sell you a guided tour, he’s lying. Needless to say, there are also unauthorized tour guides and, in general, people illegally providing tour guiding services. In Italy, tourist professions are strictly regulated by law. To access any of them you have to pass an exam and enlist in the regional registry. You are then given a badge with photo ID, registration number, full name, date and place of birth. According to new regulations, authorized guides from all across the nation can work everywhere in Italy. That’s why you could actually see badges of different shapes. For no reason at all, you should pay a ticket to enter the Sassi (as a district). Only for a few days, during the “Living Nativity Scene”, some areas are closed and accessible only for a fee. But most of the Sassi stay entirely open to the public. Even some cave churches are free to visit: for instance, the church of Santo Spirito in Piazza Vittorio Veneto. If someone would offer that one as an “included ticket” in a guided tour service, something’s wrong, again. Anyway, tickets for cultural sites in Matera are usually very cheap, between 1 and 5€ per person. The only exception is the “Crypt of the Original Sin”, costing 10€/pax. Among the several misconceptions about Matera, one of the most widespread is the one regarding the Basilian monks. The similarities between Matera and Cappadocia’s natural and cultural landscapes moved several scholars, in the past, to hold the followers of Saint Basil responsible for the rich and diversified cave heritage of our territory. Despite this theory has long since been outdated, you can still hear or read it way too much. Other commonplaces about Matera picture it as a city with a mostly tragic past. Poor and troglodyte, whose inhabitants would have shared their caves with animals, the “Capital of Peasant Civilization” would be, at the same time, the “most ancient city in the world“. Or, sometimes, just the third. In (luckily few) grotesque scenarios, the many “caverns” in the Sassi or in the Gravina canyon would have hosted from the dinosaurs to St. Francis of Assisi. You can hear too often people referring to one of the two Sassi as “the most ancient” or “the most beautiful”. Only someone who doesn’t really know the city would say that! Or someone who wants to take you on a specific route, with specific stops. Let’s make it clear: every guide has a preferred route among the Sassi, to better tell his story. We got one too! But this doesn’t mean we would say something that is not true to force our beloved customers where we want to go. There are also somewhat positive false myths, such as believing that the water collection system is the main reason for the induction of the Sassi in the UNESCO World Heritage list. Even if it’s one of the most important and long-lasting features of Matera’s settlements, it’s not even cited among the official criteria! As a matter of fact, it was the entire man-environment ecosystem, kept in balance for thousands of years, shaping a really unique landscape, to make Matera’s Sassi the first South Italian entire Old Town to be enlisted in the UNESCO list (December 1993). So, if you’re wondering how to avoid all these tricky tourist traps and to preserve your Matera experience, that’s pretty easy! Just contact us and book one of our services!